Now that St. Patrick's Day is over, we're full steam ahead towards Easter! 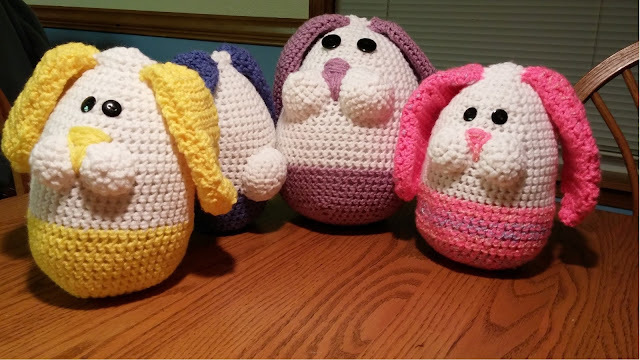 We love these cute bunnies by YarnologyPhD and will have tons of other great Easter Basket Goodies at the Holiday House Spring Boutique that opens in less than 3 weeks! Bunny Buddies by YarnologyPhD, are the perfect choice for Easter gifts. They're bright and cheerful, cuddly and sweet. YarnologyPhD, was created after my college age son, had a traumatic stroke. He went on to receive his PhD in Mathematics. I feel that I too gained a PhD! A PhD in life! Creating, objects out of various types of fiber, is my passion. Choosing colors and textures, inspire me to create my art. I hope you like my gifts.